Are you thinking of mooring your boat on one of Calcutt Boats’ two Warwickshire marinas? OK, the marinas are located at the heart of the inland waterways network just a stone’s throw away from the canal capital at Braunston. From here you can head north west along the Grand Union towards Leamington Spa, Warwick and Birmingham, south for half a mile to Napton Junction where you can join the South Oxford and meander through beautiful rural countryside to Oxford where the canal meets the mighty Thames. If that route doesn’t suit you, you can turn left at the junction, follow the combined Grand Union and Oxford canal to Braunston for two hours before either turning left along the North Oxford towards Rugby and Coventry and then on to the stunning and little visited lock free Ashby canal. Not for you? You can turn right at Braunston junction then, past the village rich in canal history, feel your way through a mile long tunnel and then make another choice at Norton Junction. You can turn left, endure close proximity to a busy A road, a motorway and a railway as you negotiate the staircase locks at Watford then enjoy over twenty miles of idyllic lock free cruising along one of the network’s most peaceful waterways. Or you can turn right at Norton and follow the Grand Union south towards London. There are a huge variety of routes available to you. Granted, the marinas themselves are stunning. Set in 110 acres including three SSSI wild flower meadows, over 8,000 trees in two different woodland areas, miles of regularly maintained footpaths through the site and around the adjacent 40 acre Napron reservoir, the moorings on the two tranquil marinas are perfect for nature lovers, dog owners and anyone just wanting to escape the speed and stress of modern day life. I suppose the on site facilities might attract one or two boat owners too. There’s a fully equipped workshop staffed by three full time engineers who can accommodate anything from a simple service to a full engine rebuild, another workshop for carpentry and general repairs and boat fitting, three paint tents where you can either book a complete boat repaint, or hire the tent to do the work yourself, a slipway and boat lift for pulling your boat out of the water, doing a survey or work on the hull, anode replacement and hull blacking, and a comprehensively stocked chandlery stocking everything from shackles to shore lines, pumps to paint and tiller pins to toilets. The marinas may well offer stunning scenery, a wide range of services and be ideally located at the heart of the canal network BUT the showers in the site’s toilet block are rubbish! I nearly caused myself serious injury at the beginning of last week. We knew that our water heater was on its way out, but it was working in a reasonable fashion if the hot tap was opened fully and continuously. I don’t mind a hot shower and as our water heater has never produced water too hot to stand under even with the cold mixer tap turned off, I thought I would give it a go. I was lucky to escape without serious burns. I stayed outside the shower while I turned the water on, tested the temperature with a finger gingerly poked into the shower head jet, discovered that it was running at about the same temperature as normal, then stepped into the shower tray under the jet. The water was OK for a minute until the Vailant heater began to rattle and hiss. As a precautionary measure I quickly took the shower head out of its clip and turned it away from me. I’m very pleased I did. Seconds later the shower cubicle was instantly filled with scalding steam. Some of the super heated water splashed back onto my chest and burning it slightly, but if I had remained standing under the jet I would have been seriously scalded. I turned the gas off to the shower and made sure that Sally was aware of the danger. For the rest of the week we had no hot water on the boat so we had to use the site facilities to wash our dirty little bodies. I’ve been living at the marina for four and a half years now but Tuesday’s shower in the gents toilet suite was my first. The advantage over the boat’s shower was that, as it was connected to the mains, I had an unlimited supply of water and the ability to enjoy a long and relaxing wash. So I turned the shower on full and stood under it for twenty minutes… and probably used about a pint and a half of water. I think if I had covered myself in dog food and let Charlie and Daisy lick it off I would have had a more thorough clean. I couldn’t be bothered dragging myself a quarter of a mile to the shower block on Wednesday to be dribbled on so I went without. On Thursday morning I took James across the marina to the enclosed double dock behind Locks marina to have the problem sorted out. The Vailant gas water heater had to go. I don’t know how many years it’s been fitted in the boat. It’s possibly the original 1977 water heater. It’s certainly too old to find any spares for. Rather than remove the Vailant completely, which would have involved taking the shower cubicle apart to get to it, the heater was disconnected from the boat’s water supply and left in place. Rather than have a new gas water heater fitted, I’ve come at the problem from a slightly different angle. I’ve never had hot water supplied by the engine. I discovered that the reason for this was that the calorifier under the bed wasn’t actually connected to the engine. It is now. Actually that’s not quite right. The engine has been connected to a new SureCal fifty five litre calorifier fitted with a 1KW immersion heater. The old forty litre calorifier needed removing first which was an interesting exercise. Of course the calorifier was too large to come out through the access hatch in the bed base so the base itself had to be removed. The mattress of course had already been removed and manouvered into the passage through the galley. The bed base, constructed from a sheet of 12mm ply held in place with what seemed like hundreds of screws hidden under a coating of thirty year old varnish eventually followed it. The calorifier was still filled with water and couldn’t be drained where it was so the 100lb deadweight had to be carefully lifted from under the bed, over the bed drawers and into the bathroom where the water was drained into the shower. The SureCal calorifier was fitted into the empty space, connected to the engine and to the boat’s water supply and connected to the shore line socket. The bed was put back together again, the mattress brought back into the bedroom, the wardrobe, emptied to allow access to the pipes behind the Vailant, was filled with clothes again and the job was done. I now have hot water from two different sources. I get piping hot water when the engine is running and also via the immersion heater when I’m plugged in to a shore supply. In theory the immersion heater could be run from the battery bank using the inverter but it would be too much of a drain on the batteries. If I’m out cruising I’ll either have to run the engine for an hour to heat the fifty five litre calorifer tank or keep a suitcase generator on board to provide power to the immersion heater. The new hot water system on board is wonderful. The shower temperature was impossible to manage with the Vailant. I either had water almost too hot to use or too cold to be pleasant as the burner would cut out if cold water was introduced. Now the mixer taps work perfectly. I had my first shower from the calorifier hot water supply last night. It was marvelous. I could have stood there for hours. I was a very happy bunny! My first week back at work after a fortnight away has been very busy. Of course, unlike the days when I was running my own business, or the decade before that when I was managing pubs for a national brewery, there was no stress coming back to work. In my previous life the last few days of a two week holiday were ruined by the constant worry of anticipated work related problems. Would the outstanding bills have been paid? Would the staff have done all they they should have done? Would enough new business have come in to allow the outstanding bills to be paid and, in the case of the often violent pubs I ran, who would have been injured and how badly while I was away? The only problem I came back to was grass a little longer than I went away. A lot longer actually. Pat hadn’t been able to keep up with the phenomenal growth caused by the mixed rain and sunny spells while I was away. It’s not a bad life though when the worst problem you can expect to return to is grass four rather than two inches long. There have been other projects to fit in as well though. While I was away marina manager Martyn and his wife Sue left. They had been living in the cottage next to our offices and chandlery. With the property now empty it’s time to do some long overdue maintenance. The overgrown walled garden had to be cleared as an interim measure before we landscape it in the autumn. The hawthorn hedge and the adjacent damson tree next to the cottage in front of reception needed a little TLC courtesy of a two man cage bolted to the front of our Merlo tele handler and either Pat or I suspended above the twenty feet high hedge armed with an underpowered blunt electric hedge trimmer and our far more useful pruning saws and long handled loppers. While we had the Merlo out with the cage attached we cleared the cottage gutters, rodded a blocked drainpipe, unblocked the drain beneath the gutter, removed a very comfortable nesting toad from the leaf mulch and generally tidied the place up. Another part of the project was earmarking several trees in the cottage’s orchard for removal. One is an old Christmas tree planted in the cottage garden in the mid seventies after enduring a two week stint in the house wrapped in tinsel. It’s now forty feet high and totally dominates the small orchard. I’ll take it down at the end of the year along with a too large pear tree and several self seeded ash saplings which are growing out of the lock wall in the garden. Oh, I nearly forgot. My stainless steel chimney arrived on Tuesday. Isn’t it a thing of beauty? Obviously it will work better if I actually fit it on the roof over my chimney collar but it’s one of those rare weeks of the English summer when thermals and a roaring coal fire aren’t my first priority. The piece in the centre is the one which is fitted over the collar. The piece on the left is a coolie hat specifically designed for this chimney. See the bayonet fittings on it to keep it in place in a high wind? Clever design, isn’t it? 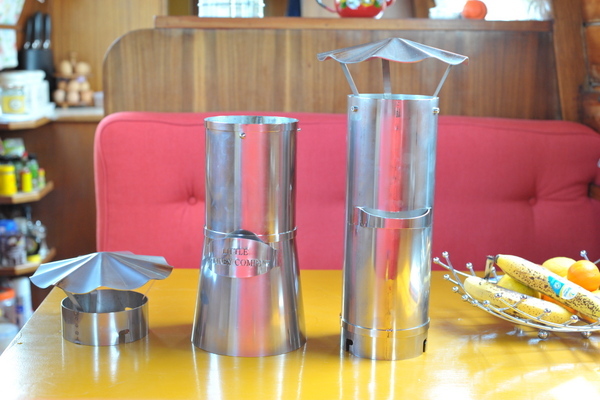 The separate coolie hat is to fit over the centre piece to use as a short chimney when cruising. When the boat is moored safely away from the dangers of low tunnels, bridges and overhanging trees, the coolie hat is replaced by the section on the right which, because of the increased length, allows the fire to draw better. All I need now is to wait for some cooler weather to test it out. Next week? The week after? Surely not as far away as the autumn? It’s not often I’m right and I’m wrong again. It’s something my father used to say to me jokingly but far too often when I lived at home, but he was usually right. Last week in the newsletter I told you about my return journey back to the marina from Market Harborough. I mentioned that when Sally booked in to come back up the Foxton flight. When she told him that the boat name wasn’t displayed anywhere on the boat, he told her off. I told him that the boat’s license number was displayed and that that was all we were required to do. I don’t know why I was under the impression that the boat name didn’t need to be visible. I think it was something I was told when I first came to the marina. I took the statement as fact and didn’t look for confirmation anywhere else, including on the licensing terms and conditions. You can call your boat anything you like within reason as long as it isn’t offensive. We used to have a boat moored on the canal close to Caluctt with a name verging on the unacceptable but it was quite cleverly done so you needed to work quite hard to take offense. The registered boat name was “The Dogs” then, as often is the case, the “home port” was written underneath. In this case the home port was “Bow Locks”. See what I mean? 7.1. You must display the Boat’s name, index number and the Licence on both sides of the Boat so that they are always easily visible by our employees on the towpath or on the Waterway. If you do not, we may place a sticker on the Boat or on any cover on the Boat showing the number, which must not be removed unless the number is displayed in some other way. The licence is specific to the boat and to you so it is important that you notify us if anything changes. We can take change of home address information by telephone, but if you change the name of the boat, if your home mooring changes, or if you sell or give the boat to someone else you must let us know in writing. You should include details of any changed names, addresses or telephone numbers. We will record any change to the name of the boat, so that the next licence issued carries the new name. We will not issue new licence discs before the current licence expires unless you specifically request this (a £20 charge applies for the replacement). You can call your boat what you want. You may want something which is unique, something which is not displayed on any other boat on the waterways network. If that’s the case, stay away from waterway themed names like Kingfisher, Dragonfly, Willow, Osprey, Mallard or Kestrel. You will also want to avoid boat names which reflect a tranquil state of mind such as Serenity, Tranquility, Free Spirit, Harmony, Patience, Nirvana or Bliss. How about the clever “Festina Lente”. It’s the Latin translation of a Classic Greek phrase meaning “make haste slowly”. It’s far from unique though. Festina Lente just sneaks in to the most popular boat names top one hundred at number ninety eight with thirty three boat registrations. The most popular name on the database with nearly twice as many registrations as Dragonfly’s 138 registrations is Kingfisher, proudly displayed on 228 boats throughout the network. My favourite unique boat name is Cirrhosis Of The River. At least I thought it was unique. I’ve just checked and there are about ten boats with the exact or very similar names. Another name I like, and this one is unique, is Baggers & Bling. The boat pulled on to our wharf for fuel a couple of years ago. I asked the make owner about the name’s origin. He told me that he ran a successful business selling plastic bags to industry. In fact the business was so successful that he purchased his narrowboat from the profits and also kept his wife in flashy jewelry, hence the “bling” part of the name. How do I know which are the most popular boat names and how many there are of them? Due to the freedom of information act and the hard work done by the owners of two of the more popular narrowboat sites, there’s a free to access listing of over 100,00 boats pulled from data belonging to CART, the Broads Authority and the Environment Agency. You won’t find any personal details but the boat’s name, registration number, length and sometimes year of build and builder. You can search for boats here or view the top 200 most popular names here. “I am delighted to say your account of your recent adventure amused me! A great many single boaters, male and female, are the least chatty people . . . until they end up in a lock with you. Talking of which, your boater who assumed that everyone else would do the work to ensure his passage through locks at Watford, is certainly not the only one about. Some people are appreciative of those who offer assistance, others … well I am also retired and quite happy to sit aboard the boat, drink coffee and watch the world come to a grinding halt! SPEED – I often wonder about this aspect. What is the actual problem? Using a pin to secure the boat to a bank seems to be the only real problem. One thing that I have found to be the most useful is the use of tyres as fenders! I have a tyre with holes drilled through to allow water to drain away quickly when lifted … hung by rope from the roof of the boat … the rope is attached to a ring … a rope passes through the ring and is tied across the roof from one side to the other … this permits the tyre to be used on either side of the boat. Why not just unclip from one side and re-clip on the other? I wrote about narrowboat shared ownership in this post. 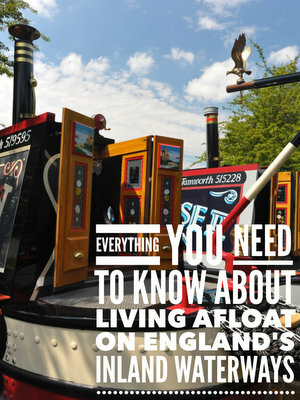 It’s a great way of dipping your toes in the water of narrowboat ownership. Forum contributor Paul Biggs has added a very useful post to the forum detailing the cost of his own boat share. You can read it here.